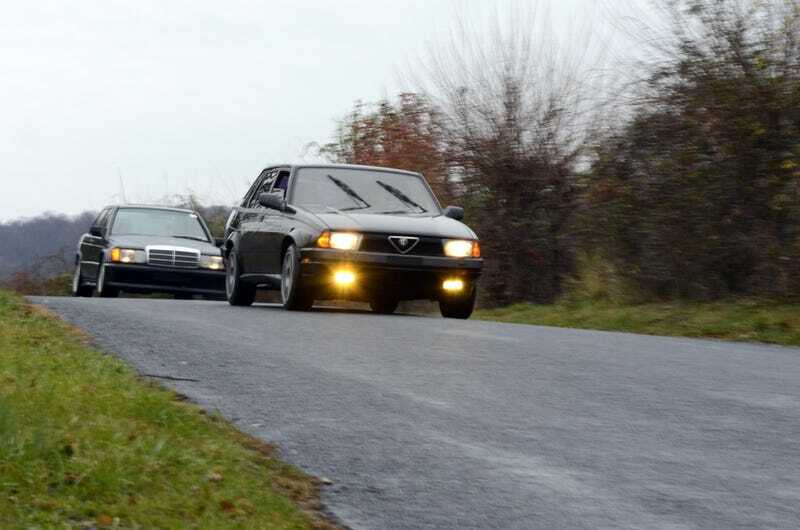 My older brother outbid me on a 190E 2.3-16 three years ago. I’d sent him the link on the last day of bidding. Shared my reservations about taking in another needy West German export. At the time, my 91 318is and 84 GTI had no problem converting my free time into bruised hands. I faltered; my brother won. Our dad owned a 2.3-16 for a brief half year 4 years prior to the bidding. But for reasons unknown, our dad’s heart shrank the fall of my freshman year of college, and he sold both the 2.3-16 and his 73 BMW 3.0CS. Having lost out on this one at least, I hoped that my memories of the 2.3-16 were overly romantic. That my e30 would deflate the inflated nostalgia I felt for the Cossie. After all, according to every Craigslist ad in the history of the 318is, I had the poor man’s M3. Who was I kidding? The 2.3-16 captured me in a way that the e30 could not. The induction noise was just as addicting as I remembered it. The hood ornament as enjoyable to rest my eyes on while waiting at stoplights. The low seating position lending itself to the same sense of occasion. Not particularly quick, not necessarily the sharpest car on a back road, but never short on enjoyment. I would need to dig deeper than the e30 if I wanted to match it. Enter my Milano Verde. I remember calling my dad, a few beers in, on the night that I bought it. I explained to him how such an unremarkable car had me weak in the knees. Firm seats. Quick steering. The haste at the top of the tach. And the noise. I could hardly wait to meet my brother at our parents’ house to compare the cars during Labor Day weekend. Serial mechanical failures kept me from ever driving that car alongside my brother’s 2.3-16. First due to the grenaded bottom end. And then the axle that flew into orbit. Then there was the first set of bent valves. And the second set. Then a torsion bar snapped mid-corner. And finally, the fire that took away my garage, my tools, my Milano, my GTI, and two of my brother’s cars. Unexpectedly, the fire brought light to my darkest year ever. It led me away from Ford, where I was my manager’s punching bag for a year. To a weekend spent with distant friends as we cleared the rubble. To the best week I’ve ever spent with my brother, rebuilding my garage. To time spent at the beach with my dear high school friend. To a revitalizing trip to Colorado with my girlfriend and my dog, logging 14k drama-free miles and a track day on my new Milano. To a role at a company where I am treated with respect. I’ve worried less and less about my brother ever since he bought the 2.3-16. I suspect that our thoughts run wild more often than most. Less so, when our fragile 80s sedans consume our thoughts. With time and effort, we can rebuild most anything mechanical. The certainty is comforting. Finally, after two years of delays, my brother and I went for a drive. We have another planned in May. Right now, his car is sitting in a pile of its own fluids in my parents’ garage, its steering box on the floor. It’ll work out.